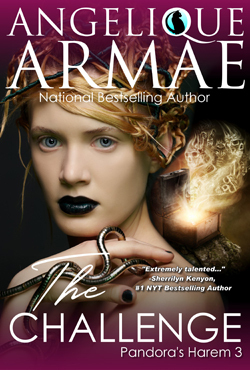 THE CHALLENGE is the third installment in National Bestselling Author Angelique Armae’s Pandora’s Harem serial. Now that I’m fully entrenched in being Pandora, yes, that Pandora, a revelation that was gifted to me on the eve of my twenty-first birthday, I am challenging Moros, the Greek god of Doom. My three well-muscled Spartans think I’m insane to push the darkest of the gods. Even Moros’s grandmother, the goddess Chaos, is refusing to stir this pot. But I have good reason for my current flight of fantasy. A smashing great potter put her wares on display at a local gallery and lo and behold, one of her vases drew me in. It was a small bit of a thing, just a shiny black urn with two handles made to look like snakes, and a lid that refused to budge. What can I say, I’m history’s most famous imp, of course I tried to pry off the top. All I got in return, however, was a zap that raced up my arm. A spark unlike any I have ever experienced before. Trust me, this was different. Plus, there is the matter of that strange mist that suddenly appeared beneath the vase’s surface, swirling about and giving rise to a colorful blend of blues, pinks, and salmon-hued clouds moving beneath the urn’s glossy glaze. I’m pretty sure no one else witnessed the revelation. So, I did the only natural thing Pandy the Imp could do—I purchased the urn, agreeing to come back after the show ended to pick up my little gift. Getting my hands on it permanently is a must as it just may be my long-lost magic box. But thieves ransacked the gallery last night and the one item that wasn’t broken—at least there are no shards remaining among the smashed bits of pottery—is that tiny black vase. Someone has it. I want it back. It may be the clue I need to find my lost box. My first instinct is to contact the potter, but as with all things associated with the world of the Greek gods, nothing is as it seems. Oh, and did I mention I have a new enemy to worry about? Chaos has backed off on this one challenge, but Athena has stepped in. And from my studies in Greek Mythology, I know that no one challenges Athena. Look at what happened to Arachne. But I’ve cast my dice. Moros has accepted my challenge and Athena is watching me like a hawk. I need my lost box, because without it, the hell I unleashed on earth thousands of years ago will never be reined in. And if Moros beats me to it, he’ll destroy the one thing left inside—Hope. And every soul needs Hope to survive. And that includes me and my sexier than sin Spartans.